It was difficult not to believe in resurrection today. 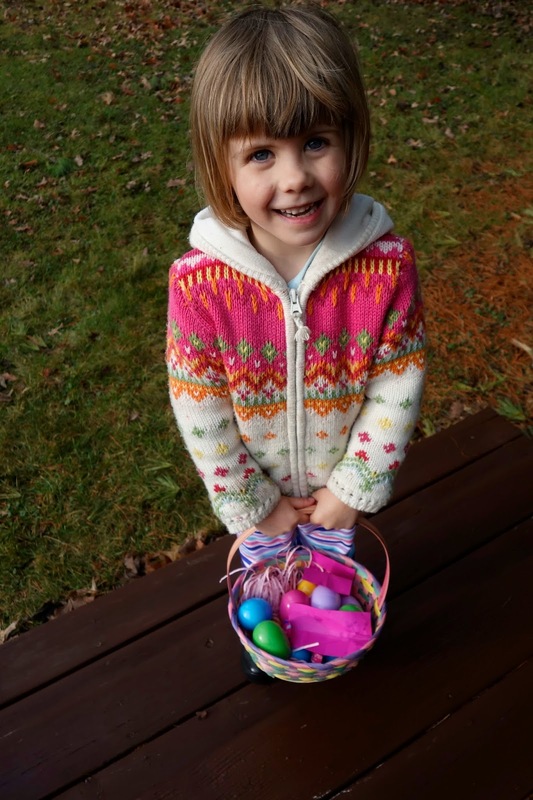 The temperature soared into the 70's and every Christian child in Minnesota with a new Easter outfit actually got to wear it (sans leggings, sweaters, and boots). There was no snow. There was soft rain last night and damp fog this morning. There was green grass and black dirt. There were buds on the trees and there were birds shaking the bushes indignantly when Thisbe came stomping with her Easter basket in hand. There were gold letters splayed across the banners at church and brass instruments braying the familiar hymns and even the most harried mothers sporting heels and dresses with waistlines. And new life quakes through your small body at an alarming rate. You still can't really move in an orderly fashion but your desire to crawl or walk or do SOMETHING causes you to spasm and twist and and bend and crane. At church your father and I tried to hold you steady but you would not sit still. You wanted to be lifted and jostled. You wanted to flirt with the old lady behind us and squeal at the offering plate. You bend and straighten, bend and straighten, the entirety of your body shouting "life, life, life." Your sister, too, has become almost manic with the sun. She bounced on her trampoline today with holy fervor, crowed triumphant at every egg discovered, and when we asked her, after the Gospel reading, if she'd heard the ending of the story, she held up the picture of the yak she'd been coloring and said "well maybe but look at THIS." After church, per your sister's request, we spread a blanket in the backyard and had a picnic of hard boiled eggs and baby oranges and bacon-scallion-cream-cheese-smeared Triscuits and almonds. You ate peach yogurt and plucked at the puffs we placed on the blanket beside you. In the late afternoon we walked to the park; you leaned forward and clutched the front of the stroller, perhaps for the view. Perhaps to feel the vibrations of the pavement in your forearms. Carol and Alvin came for dinner and we ate pulled pork sandwiches and cole slaw and asparagus and sweet potato fries. All the doors were open and the light kept sliding through the room, even after we put you to bed, even as we savored a second glass of wine. A few weeks ago a man in our town who had recently gone off his anti-depression medications left his house on a Saturday morning and hasn't returned since. A wonderful friend of ours lost his father last weekend to a massive heart attack. There are dear people in our lives who are living with cancer or who are learning to cope with other illnesses. And we said good-bye to people we loved this year, Matteus. We lost Jennifer and Graham and as we sang "And I will raise you up" today I thought of John Paul, and was so sad that you will never meet him. For people who are close to death or to what it means to live inside death right now, I can't imagine that Easter really feels like a "win." There are people we have lost and there are parts of our lives and ways of living that cannot be resurrected. Death may not have the last word, but death does have some words--and those words are powerful and life changing. We all hear those words eventually. "The light shines in the darkness," we say. "And the darkness has not overcome it." We do not say that the light dispels the darkness entirely. We say that it shines, bravely and unabashedly, in the middle of it. This year the light of our Easter celebration was only smudged, peripherally, by darkness. But that will not always be the case. I am grateful for this day. It was beautiful. Not even death can change that. I like this one because you're clutching a handful of your sister's hair. I like this one because we're all kind of a mess but your gaze is captured perfectly. Spring has sprung. Blades of grass spearing the matted brown muck, ducks waddling in our yard at twilight, leaf tornadoes swirling through the heart of campus. You can balance on your hands and knees for a few minutes if we position you just right and you're rolling front to back consistently (and you could roll back to front if you cared to). Last weekend I got to escape to Stillwater with a few lovely female friends while Daddy attempted to feed you bottles of breast milk and formula (attempted being the key word). This week was a blur for me--call committee meeting on Monday, Little Mermaid with Thisbe and Gak on Tuesday, a homily at St. John's on Wednesday, and a stint on Northfield's Art Zany radio show on Friday (with you in tow). Daddy did a lot of double bedtime duty (hurrah, Daddy!). Because I don't have a lot of blogging energy today I'm posting instead the homily I gave at St. John's and a few recent pics. And I'm feeling grateful this busyness--though tiring--is the result of wonderful gifts in our lives--friends and relatives and art and church and community. Jesus answered them, “You are wrong, because you know neither the scriptures nor the power of God. For in the resurrection they neither marry nor are given in marriage, but are like angels in heaven. And as for the resurrection of the dead, have you not read what was said to you by God, ‘I am the God of Abraham, the God of Isaac, and the God of Jacob?’ He is God not of the dead but of the living.” And when the crowd heard it they were astonished at his teaching. I know that here at St. John’s your focus this Lenten season has been on Grounding. When Pastor Pam asked me to speak, she mentioned that because I write a lot about parenting, about the mess and dirtiness of that particular world, that I might talk about the relationship between grounding and parenting. And indeed, the world of my children is a world that does not generally permit me the airy, writerly musings in which I dwelled before my lovely offspring entered the landscape. A few nights ago for example, my rambunctious four-year-old daughter chucked a throw pillow at the living room window as hard as she could. She narrowly missed my laptop but managed to bring down the curtains and the curtain rod in a cataclysmic-sounding clatter. Rather than apologizing, my daughter accused me of hurting her feelings with my “mad face” and then stormed upstairs with Dog Do, her unfortunately-named stuffed companion. Meanwhile, my 8-month-old has regressed in his sleeping habits, refuses to roll over, and has developed some kind of rash on his face. He enjoys screaming while I feed him and pooping in the bathtub. This is my ground, my dirt, my patch of earth. And if a parenting guru, someone I knew was TRULY all knowing in the behavior of children, descended from the clouds, my questions would begin like this: Do you think we’re paying too much attention to Thisbe or not enough attention? Should I try to address how she feels or am I coddling her too much? Should I have let the curtain rod incident go? Is it OK to have a mad face? Should I let Matteus cry it out? Should I have him tested for allergies? Which Northfield kindergarten do you think is the best fit for Thisbe? Is screen time OK? How much? Which shows? I could go on like this for days. Decades, maybe. I can’t go on Facebook or open an Atlantic magazine without someone telling me how certain kinds of parents, certain parenting techniques are failing our kids. We’re too protective. We compliment too often. We’re too involved. The accusations come fast from all angles and so, for a type-A but not naturally gifted parent who tends toward anxiety and fears too often the opinions of others—well, I spend a lot of time obsessing about something over which I ultimately don’t have that much control. And so you see, I’m actually a Sadducee at heart. In today’s Gospel, the Sadducees ask a question that entirely misses the point. The passage begins with the Sadducees coming to Jesus and declaring that there is no resurrection. They then ask their rather superfluous question about marriage and heaven-wives. Though some would probably say that they’re using the detail-oriented question to catch Jesus in the act of being wrong about the whole resurrection issue, I see the situation slightly differently. I see the Sadducees using quibbly questions to cover up their anxiety about the bigger matters, about resurrection and life. 1. Because thinking about the little questions means that I don’t have to think about the big questions. The truth is that these quibbly questions about parenting veil bigger questions about parenting and love and what it means to be human. My real questions as a parent don’t really have to do with sleep schedules or tantrum prevention. They go more like this: Do I know how to love? Do my children love me? Am I worthy of their love? Of God’s love? How do I make sure my children know they are always worthy of love? Will God truly care for them if and when I can’t? If I die, will they know I love them? 2. So I ask little questions to cover up my anxiety about the big questions. I also obsess about the little questions because the answers to quibbly questions offer clear direction about what exactly to DO. If I want to give my baby a good life I should feed him organic sweet potatoes or nurse him until he’s twelve; if I want my daughter to be a strong person I should use the word “leader” instead of “bossy” and let her watch Disney on Tuesdays—but only if we discuss the inherent misogyny afterward. I’m addicted to parenting articles because they provide a clear action plan. I like a clear action plan. When Jesus finally gets around to answering the Sadducees question he says, “in the resurrection they neither marry nor are given in marriage, but are like angels in heaven.” The Sadducees offer an either/or proposition and Jesus says, “neither.” The kind of answer the Sadducees are looking for misses the point. The whole difficulty with Jesus is that he offers the deep answers but he doesn’t usually provide us with specific details about how to enact these answers ourselves. Jesus says that we are worthy of love no matter what. That we are forgiven. That we are called, always, towards life abundant and that we are charged with offering signs of that abundant life to one another. But unfortunately, we are called to decipher the answers to the specific questions ourselves. Today’s Gospel lesson reminds me, as a type-A Mama trying to figure out the messy details, that these truths, about resurrection and unconditional love and life abundant must always be the answers behind my other answers. That as I make my way through the messy terrain of parenting and marriage, through friendship and citizenship and even academia, that the source of any answer I offer should be grounded in God’s abiding and eternal love. This should be the first ground I teach my children to walk upon. This should be the earth from which their sweet complicated beings grow and bloom. Dot came for a visit! With Gak before the Little Mermaid. Your sister is fully costumed. These are good women to know. I want to gobble you up on an almost hourly basis. I am a writer and a mommy and a wife and a teacher. I believe in both Santa and Jesus. I like dirty jokes and soft, lacy sweaters from anthropologie. I watch Law and Order when I should be reading and I read novels when I should be writing. My daughter, Thisbe, was born on September 3rd, 2009. My son, Matteus, was born on July 31st, 2013. I am trying to figure out how to be all the things I am at once, without sticking a fork in my head. And I am trying to fill my children up with all the best things in life: love and grace and sarcasm and good poems and chocolate. Some days I do better than others. This blog is about all the days, good and bad, because most of all, I want to give my children their stories. From the beginning.